4Life’s Aloe Vera is a whole-leaf concentrated extract and is guaranteed to be pure. Aloe’s properties are invaluable, yet delicate. 4Life purchases Aloe that is immediately chilled then pasteurized through a patented, short-time process. This assures that the enzymes and nutrients in 4Life’s Aloe Vera remain active. 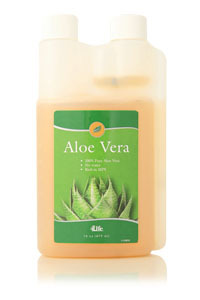 Famous worldwide for its value both as a tonic and general health pick-me-up, Aloe needs little further recommendation. Mixed with water or fruit juice, Aloe is great for breakfast, before workouts or any time you want to have a healthy drink. 4Life’s Aloe Vera is a whole-leaf concentrated extract and is guaranteed to be pure. Our processing method insures that the enzymes and nutrients in 4Life’s Aloe Vera remain active. "I have never before even considered giving a testimony for any product that I have used, however, I feel a moral obligation to let people know how I felt after taking aloe vera juice. After a few sessions of radiation treatments for prostate cancer, my wife convinced me that the aloe vera juice would keep my energy level up during the radiation sessions that I had to endure which was 37 sessions total. From my first dose of aloe vera juice, I have been able to tell without a doubt when it was time for me to take another dose. The first time I felt the difference, I was driving the interstate and for a second, I felt so good that I felt like I could get out of the car and outrun it. I am very supportive of the aloe vera product."